Background: I have now retired from a decade of covering high school football games for the regional sports TV network in Pittsburgh, which has since become known as AT&T SportsNet. My job was operating the Duet character generator inside the remote truck. I also received an extra hour's pay for serving as my own Graphics Coordinator. 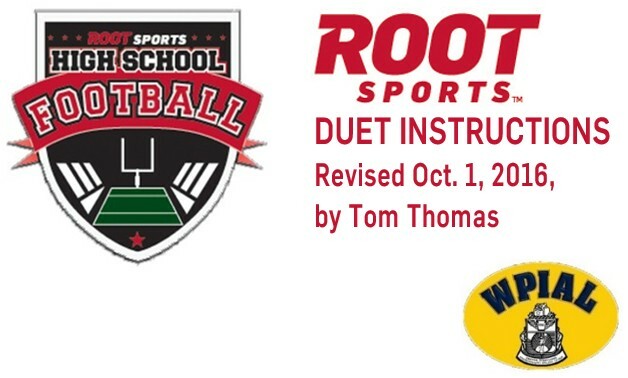 Thus I was a one-man band on my Duet, flanked only by the scorebug operator on a separate machine to my left. I had organized my work with a highly-condensed list of the computer files, or messages. Lesser-used items were in a smaller font. I hung this page on the wall, but any other operator would have had a hard time deciphering my system. Being a conscientious sort, I wondered what would happen if I became sick and someone else had to fill in for me. My substitute would have no idea what to do, and there would be no Graphics Coordinator to tell them. Therefore I prepared two pages of instructions and hung them on the wall as well. Fortunately, I never had to miss a game. 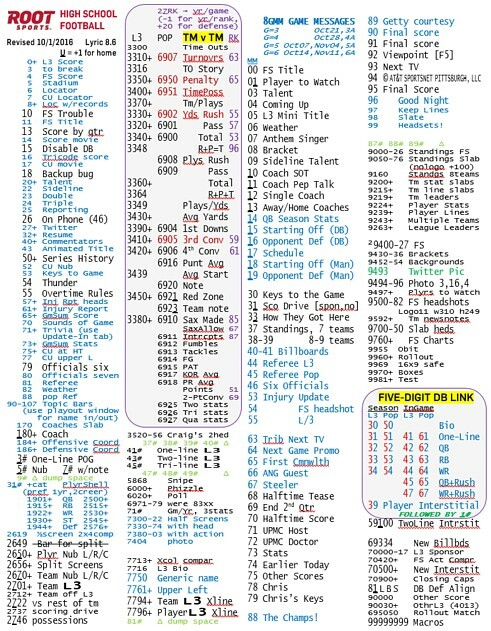 But, for posterity, below is the cheat sheet from my final season. This graphics package gets its team and player data from spreadsheets called ROOT_CFB_HOME_AWAY and ROOT_CFB_TITLE. You can fill the spreadsheets at home, but during the game they need to dwell inside the folder named I:\ROOT\Excel\DB_LINK. A blank HOME_AWAY that you can use as a starting point can be found inside DB_LINK\Spreadsheet_Blank. Don't rename a spreadsheet. You'll have to keep track of old and new spreadsheets by storing them inside properly identified folders. Then when you arrive at the truck, copy the set you want to use into the DB_LINK folder in place of the set that was there before. When saving a spreadsheet, save it as an Excel 97-2003 Workbook (.xls), not as the more modern Excel Workbook (.xlsx). Make sure that under the Review menu of each spreadsheet you've enabled Share Workbook, or the Duet may run very slowly. Option 1... In Lyric, click Config, Preferences, Browser, Advanced, Add. Option 2... In the Control Panel, click Administrative Tools, Data Sources (ODBC), Excel Files. And then... Click Microsoft Excel Driver (*.xls), Select Workbook, navigate to the I drive and thence to I:\ROOT\Excel\DB_LINK, highlight ROOT_CFB_TITLE, and click OK. Type ROOT_CFB_TITLE in both windows and click OK. Repeat for HOME_AWAY. Team names and other information go in the Master tab. Typing a team's tricode will pop in much of this information if you've already entered it in the other tabs. Rosters, including height, weight, class, and season stats, go here. Pos1 should be the player's offensive position (such as QB), unless he primarily plays only defense. Other positions that he sometimes plays can go into Pos2 and appear in the rarely-used lower-third bio. This spreadsheet also has a section for the starting lineups. Just type in the position and the uniform number for each player. The folders to copy are called ROOT, and they should already be on the truck's I: and J: hard drives. They're a pared-down version of the college football package we received from Root Sports in Denver. We've renamed that original version ROOTSTOCK; there, if you want them, you'll find many elements we didn't think we'd need, such as college logos and national rankings. Copy the images and headshots for your two teams into I:\ROOT\Images-Team\Away and \Home, respectively, overwriting the previous week's. Do this before launching Lyric, lest some messages still display the previous week's elements. And now you're finally ready to launch Lyric 8.6! The message directory, developed for College FootBall, is called ROOT\CFB_Messages (not merely ROOT\Messages). Load the user profile from I\ROOT\Database\HSFB-2015-09-22. Load the macros by reading message 99999999. 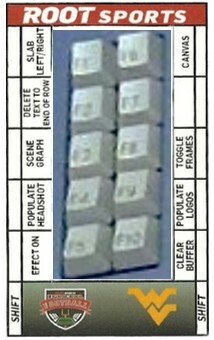 This will enable a number of "hot keys," as diagrammed above and on the left. Also, Alt / will toggle between home and away. On our printed address list, the ones labeled "Pop will appear to animate up out of the score bug. For example, if I've prepared one of these for player 47 in the white uniform, as soon as the director calls for the player's shot I call out pop white 47. The director adds the blind font and I animate it. Afterwards he may cut clean to another camera, or I may animate the font off. If my font refers to both teams (see TM v TM on the list of addresses), I call out pop stat. But we usually prefer the scorebug operator to handle the pops for team stats such as this. All of these have lower-third versions, but often it's easier to get a pop into the telecast. You may have to use Alt Home before you can type on a page. When you call it up again, it will display a later keyframe with the animation played out to the end. The last two digits specify the graphic according to the printed list (for example, anthem singer is 07). For the 3A final, 8307 would be the anthem singer. See FIVE-DIGIT DB LINK on the list of addresses. The first digit is 3 for a lower-third or 5 for a pop, unless we're talking about in-game stats which are at 4 or 6 respectively. The next digit identifies the genre: 0 for a bio, 1 for a one-liner, 2 for passing, 3 for rushing, 4 for receiving. Combo stats for rushing QBs and receiving RBs are at 5 and 7 respectively. Last comes a three-digit player number, 1#. An underlined digit means to add one for the home team. Thus if a player's uniform number is 47, 1# means 147 if he's a visitor or 247 if he's on the home team. Therefore, to pop season (5) rushing stats (3) for the home team's 47 (247), call up 53247. On my abbreviated roster, I list his number as 247 and write 53 in front of it if this stat is available for him. Caution: we don't have headshots for most players, so if you call up their lower-third you may need to ignore the error message. All scoreboards come from the bug until the end of the first half. Then (with G=3 to 6), having promoted the halftime show with 8G68, you'll go to break with 8G69, then use 8G70 during the halftime show. One player from each team is named a Player of the Game. Start with 3#, press Font 3 to add the POG note, press Font 1 if there's a headshot, and type in a couple of stats. If a Getty photo is part of the show, record the courtesy to 8G91, then start your end-of-game rollout with the 8G90 final score. Otherwise start with the 8G91 final score. In either case, use Read and F5 repeatedly to change until the 8G95 final. You'll find your Good Night at the next address.